I like to go to and host parties — and around this time its all about Football!! Hosting a Championships or Super Bowl Football party? 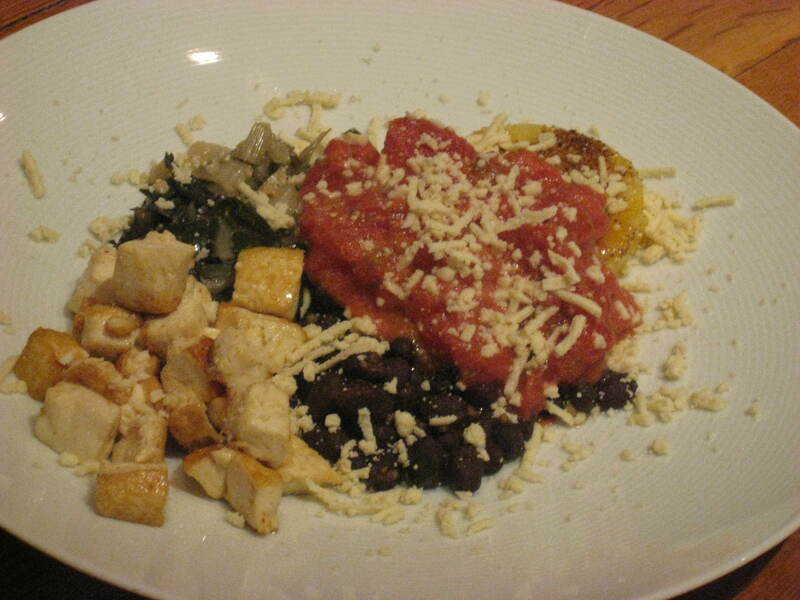 Or just attending one and need a fabulous dish to bring….try this one out and let me know what you think. I am sure you and everyone else will be super delighted!!! 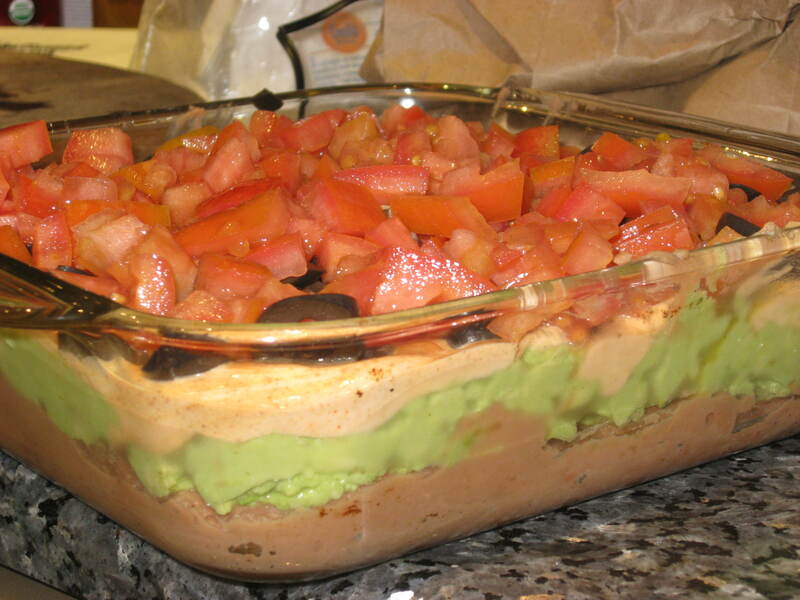 Spread a layer of refried beans in the bottom of an 8 inch by 8 inch quart glass baking dish. Spoon avocados into a bowl and mash with the lime juice. Spread on top of the refried beans. Stir together the sour cream and taco seasoning, and spread over the avocado. 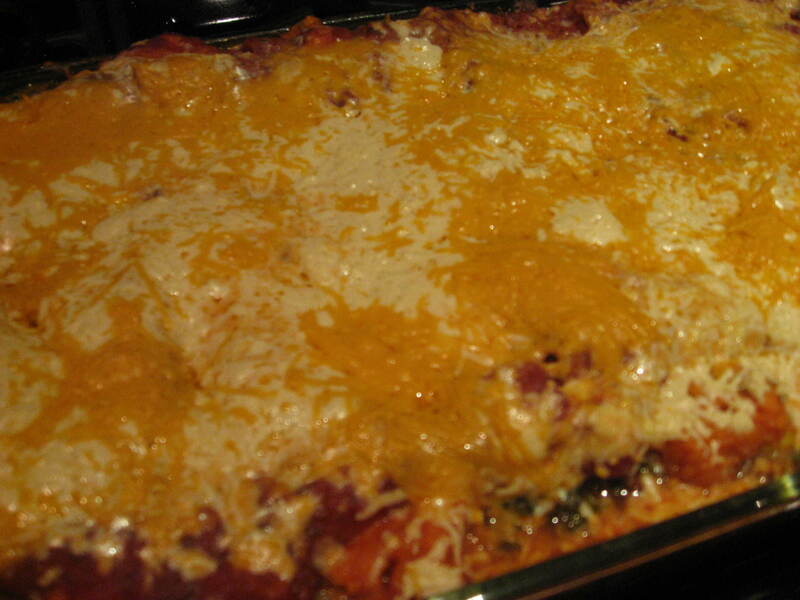 Sprinkle the chiles over the sour cream, and top with a layer of black olives. Add the tomatoes, and sprinkle with the cheese. 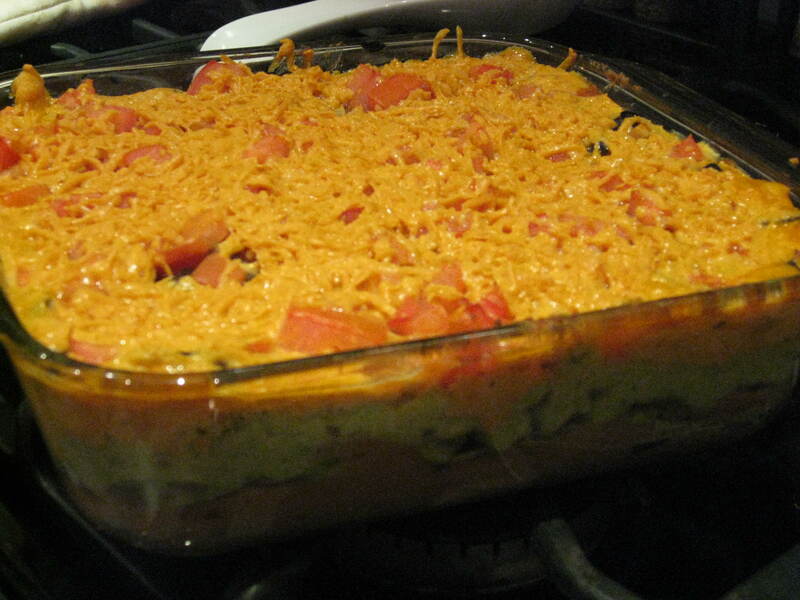 Heat the dip for 15-30 minutes or until heated through and the cheese is a bit melted. I was talking about my Watermelon & Mint Salad with my friend Alex. 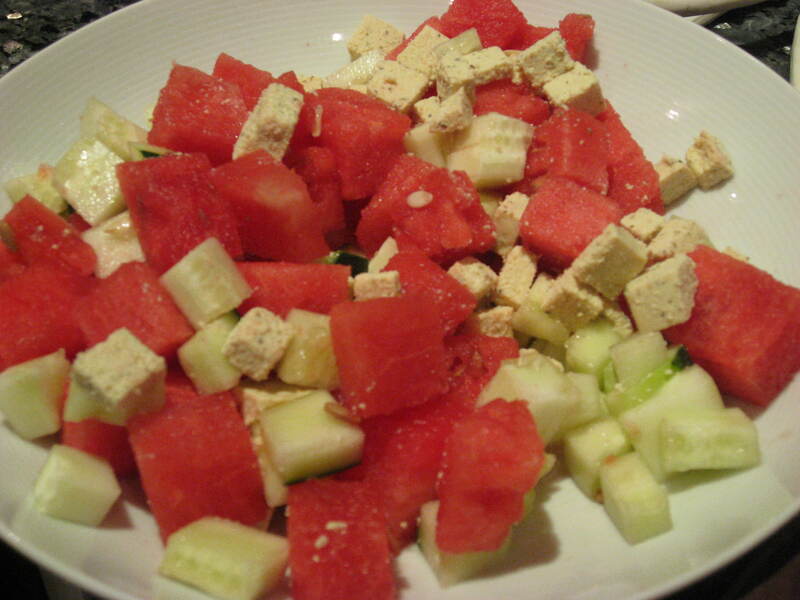 He suggested a watermelon and cucumber salad! YUM! I love both ingredients so much! 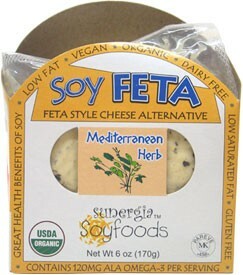 Such a refreshing salad 🙂 I also had wanted to try this yummy soy feta out and it was a perfect addition to this salad. Great idea Alex, Thanks! Combine everything together and enjoy! Would be yummy with mint as well. This was so super fast and I whipped it up with ingredients I had in the house. Love that! I bet this would be great for kids and those peeps who are not into their veggies. 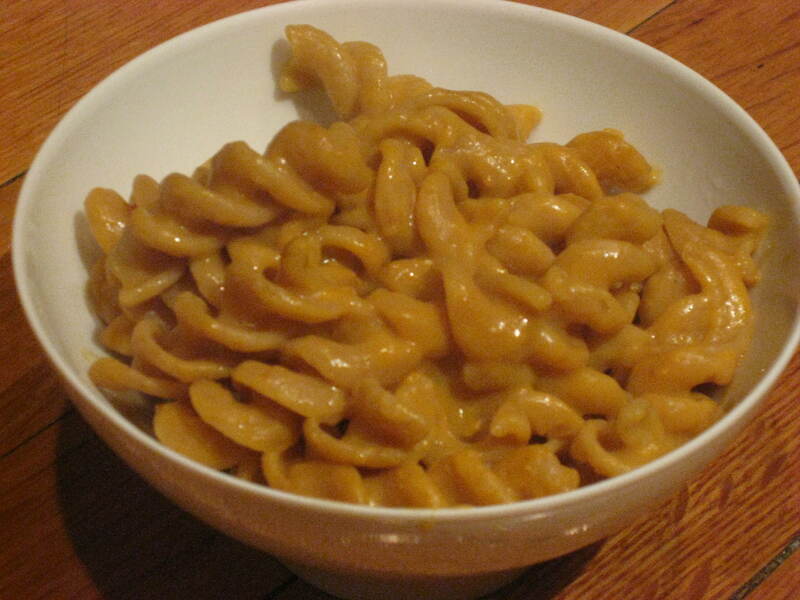 The squash is just folded right into the cheeze sauce, perfecto! 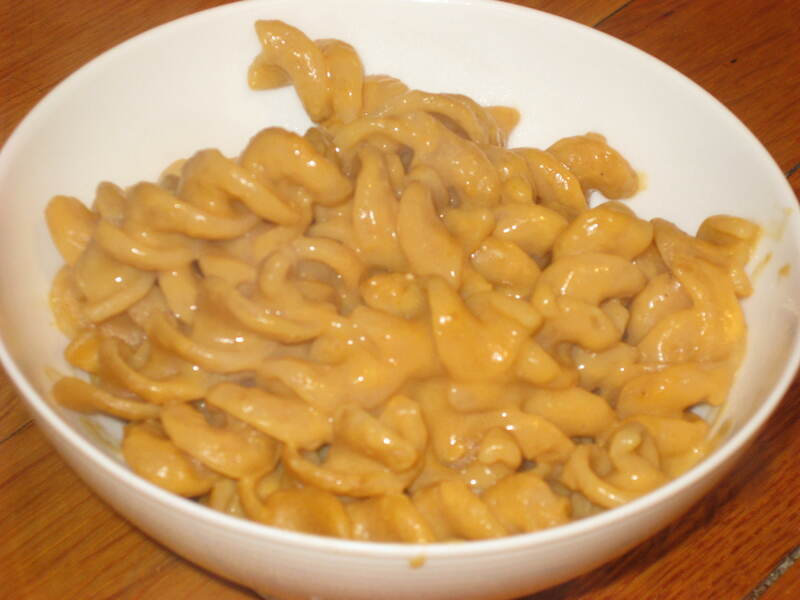 This was surprisingly easy to make and deelish! Michael and I both loved it so much!! I would say double this recipe as it will go FAST 🙂 This dish is hearty with great flavor. This is definitely a great dish for people transitioning to a vegan diet, meat-eaters you want to impress with how deelish vegan food can be, and of course Vegans will love this too!! So yum!!! Preheat oven to 500F. 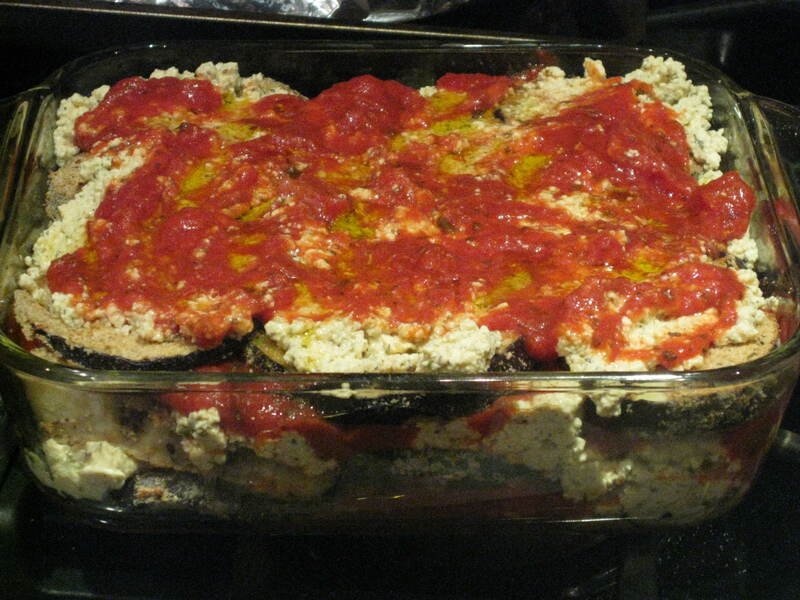 Empty entire can of tomatoes in a ceramic or glass baking dish, add coconut milk, and place in the oven. Bake 35 minutes. Meanwhile, heat 1 tbs. olive oil in a saucepan. Add 1-2 cloves diced garlic, 1 tbs. jerk seasoning and cook 2 minutes. Add entire can of black beans and set heat to low, stirring occasionally. Separate swiss chard stems from leaves. Dice stems very fine and add to a saute pan with 1 tbs. of oil and 2-3 cloves diced garlic. Heat through on medium 2-3 minutes, then add chopped leaves, apple cider vinegar, and 1/3 cup water. Cover with a lid and set heat to low. Check on the tomato sauce. Stir in fresh thyme and continue to roast. Drain, blot and press Tofu to release liquid. Slice into 1/2″ cubes. Heat vegetable oil on medium-high heat in a non-stick pan and add tofu, sprinkling with salt and cayenne. Let tofu sizzle for 6 minutes without stirring until a crust forms. Turn tofu over and cook for another 4-5 minutes. Remove from pan and train. In the same pan heat 1 tbs. olive oil on medium heat. 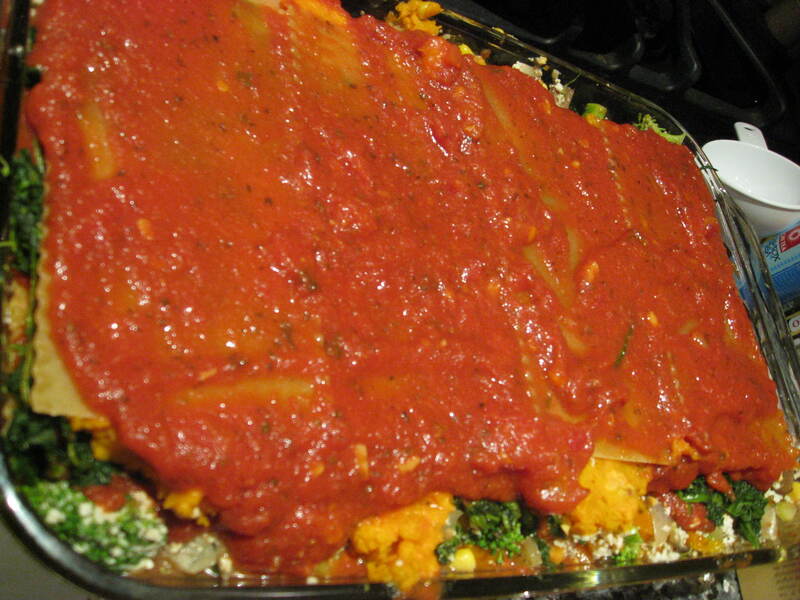 Slice polenta in 1/2″ thick slices. Sprinkle one side with remaining 1 tbs. jerk seasoning. Fry polenta, about 3 minutes per side until light brown and crispy. 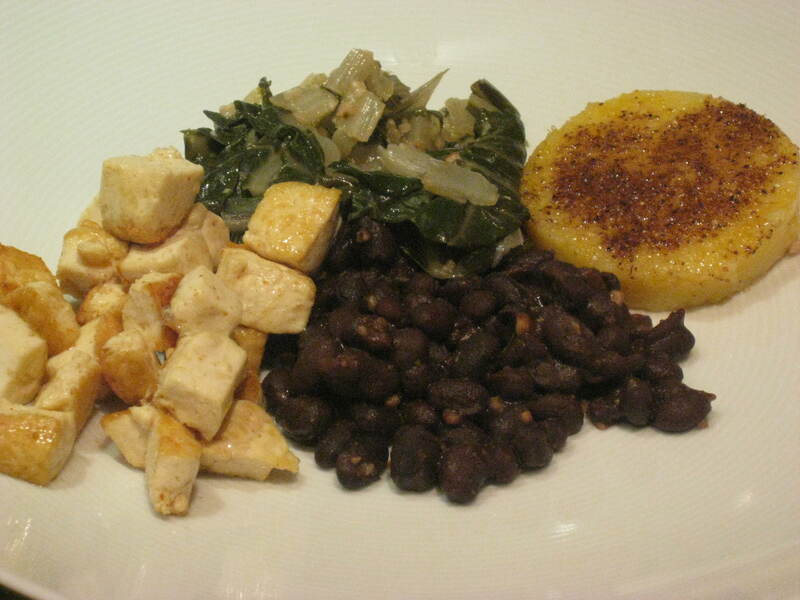 To serve: spoon about 1/3 cup of beans on a place, 1/3 cup of tofu. 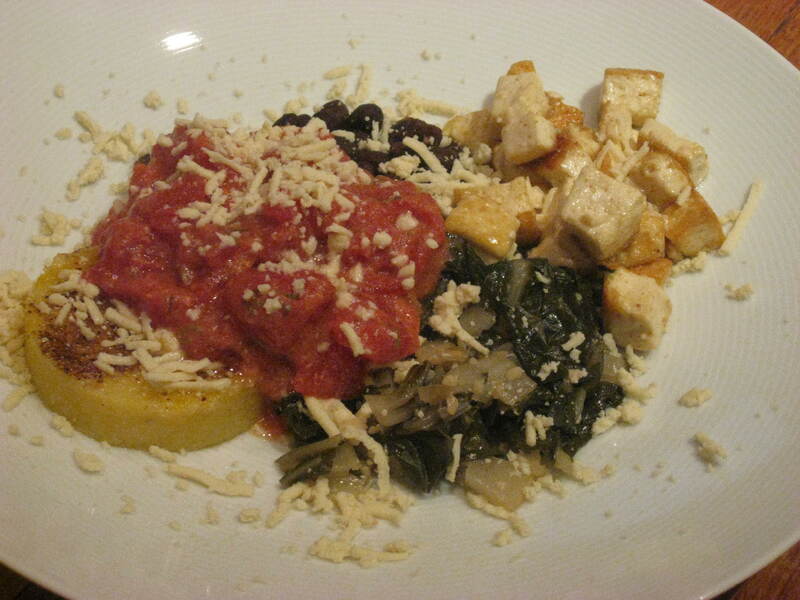 Top with a heaping spoonful of greens and a slice of polenta. 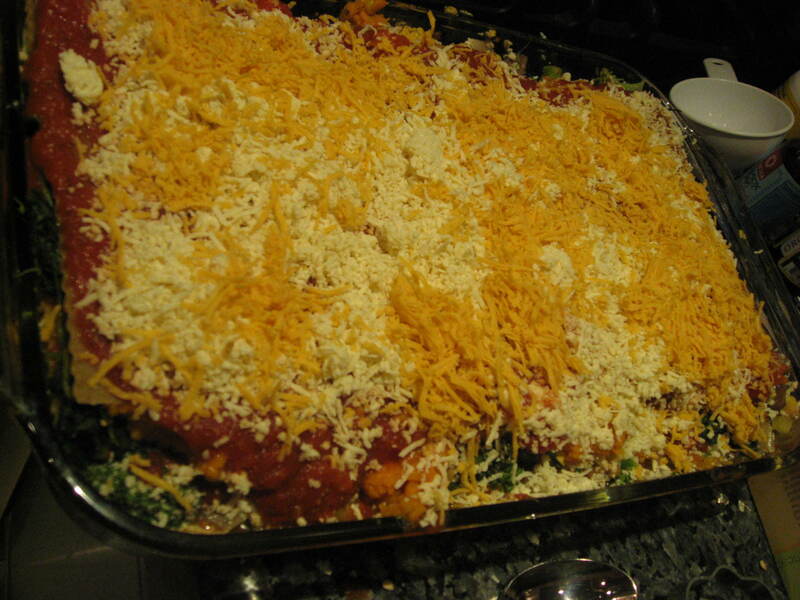 Top with about 1/4 cup tomato-coconut sauce and a sprinkling of daiya cheese and enjoy! Saute the “chicken” sub in a large pan with the Earth balance and chopped garlic. 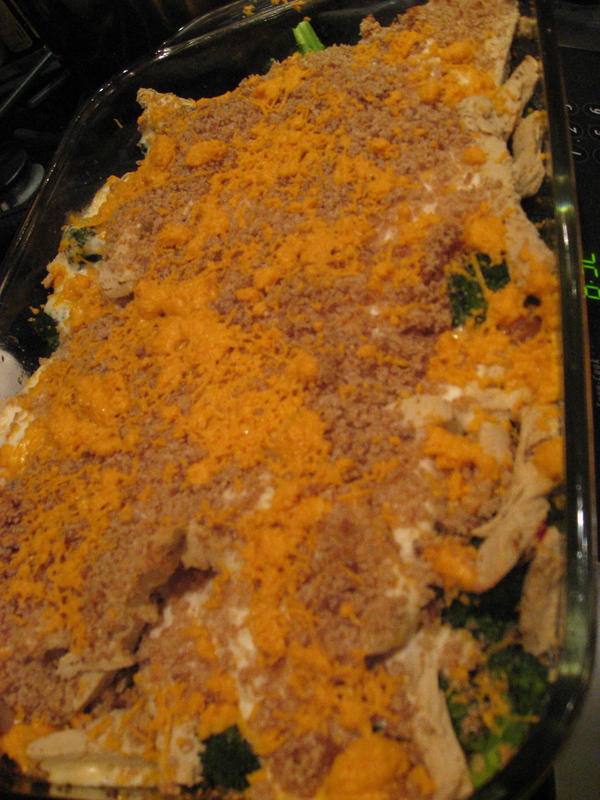 Spread the steamed broccoli in the bottom of 9 x 13″ baking pan. Cover that with the “chicken” sub. Sprinkle with salt and grind pepper over that to taste. 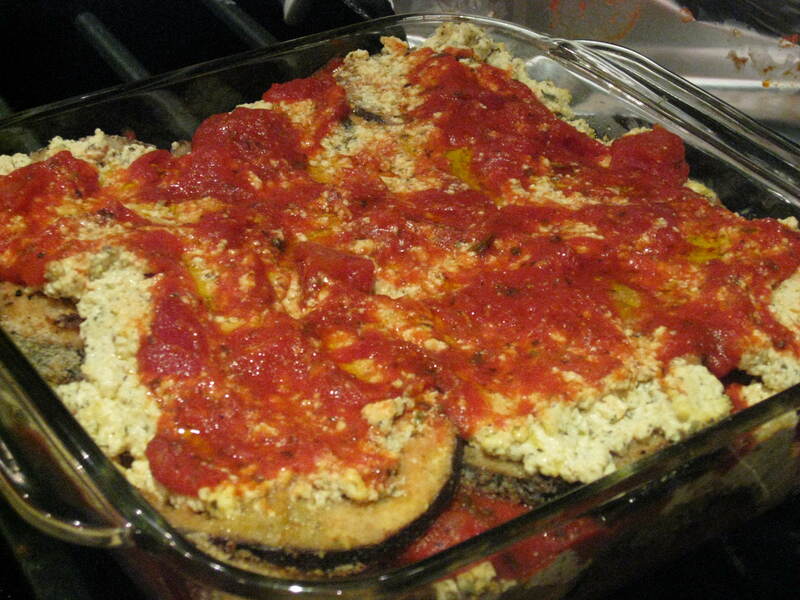 Spread 1 cup of the vegan “cheese” over the top (save the other half for the top of the finished casserole). Mix the bechamel sauce with the sour creme and lemon juice, stirring well. 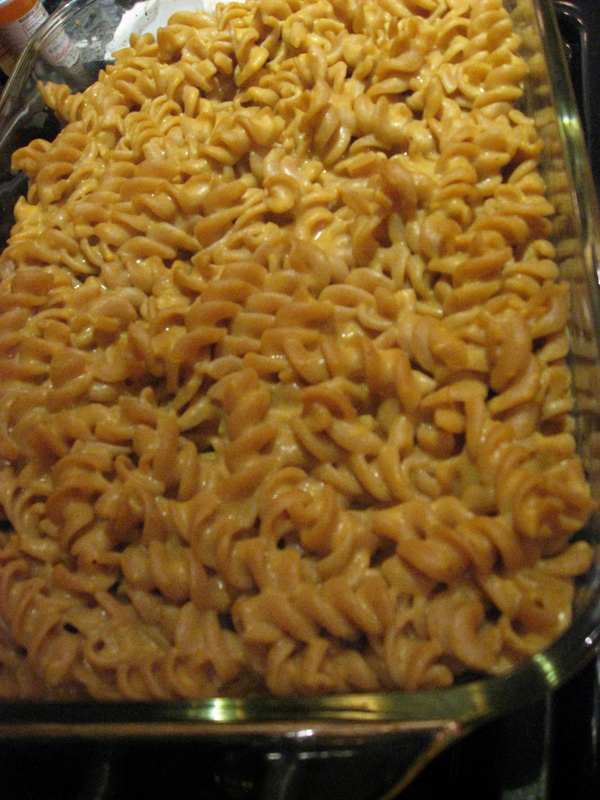 Drizzle this evenly over the casserole and smooth it out. 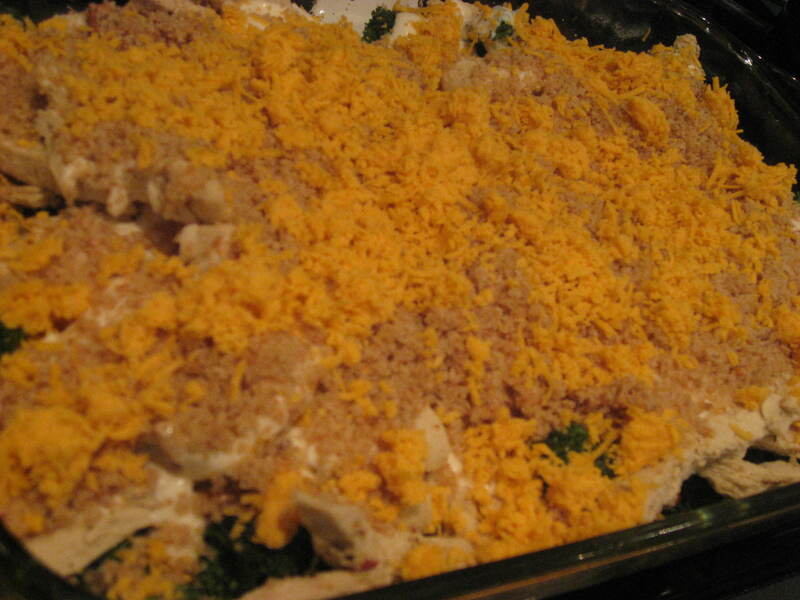 Sprinkle evenly with the breadcrumbs and then spread, sprinkle or dot with the remaining “cheese”. Place all of the Blended Mixture ingredients, EXCEPT the nutmeg and pepper, in the blender and blend until VERY smooth. Set aside. Melt the margarine in a medium, heavy saucepan and whisk in the flour. Whisk it over medium-high heat for a few minutes, but remove from heat before it starts to change color (you want a white “roux”). Scrape this into the Blended Mixture and blend for a few seconds, then pour the mixture back into the pot. Stir over medium-high heat until it thickens and boils; turn down and simmer on low for a few minutes. Whisk in the nutmeg and pepper.